Hello! I hope you are having an awesome summer so far! I’m happy to share this no-bake cheesecake with you. No-bake desserts are so perfect to make in the summer time. You don’t need to turn on the oven and it’s so easy to make. This recipe takes about 25 minutes to prepare. The rest of the time is spend waiting for the cheesecake to set in the refrigerator. It’s an incredible dessert to make the night before and enjoy the next day. Plus, this cheesecake has incredible flavours and textures. I hope you enjoy this No-Bake Coconut Lime Mascarpone Cheesecake! Full ingredients and instructions in the recipe card down below. Grease and line a 9-inch round springform pan with parchment paper. In a medium bowl, combine together graham cracker crumbs, toasted coconut, and coconut oil (or butter). Then press the crust into an even layer in the pan's base. Place in the freezer. Place all the filling ingredients (mascarpone cheese, cream cheese, sweetened condensed milk, lime juice and zest, vanilla extract, and salt) in large mixing bowl. Use a stand mixer or electric mixer, whisk the ingredients until well combined. Spread the filling into an even layer over the crust and top with more toasted coconut and lime zest. Cover and place in the refrigerator until set (at least four hours). For the crust, I used melted coconut oil as the “glue” that holds together this easy no-bake crust. This increases the nutty coconut flavour along with the toasted coconut in this simple graham cracker crust. It is so good! If you don’t want to use coconut oil, you can simply substitute with melted butter. You can also substitute the graham cracker crumbs with other cookie crumbs such as biscoff or speculaas (speculoos) cookies. For the medium cake part, aka the fluffy (not dense), creamy, delicious filling, I used a combination of mascarpone cheese, cream cheese, and sweetened condensed milk as the base. The mascarpone adds a layer of flavour that's milky, slightly sweet, and has a tangy note. It most notably adds this wonderful texture that’s so creamy and light. The thicker cream cheese gives the cake additional body (it’s thicker), and the sweetened condensed milk gives this filling a nice sweetness and keeps the cheese cake super smooth (with the exception of lime zest). Speaking of lime zest and juice, there is a healthy amount of both in this cheesecake. I love limes for their bright and acidic flavours and sweet aroma. It goes perfectly with the shredded coconut. Then there’s the pure vanilla extract that adds that special something extra to many desserts along with sea salt. The salt actually accentuates and enhances the sweet and tart flavours in the middle layer of the cake. Last, but not last the topping is the finishing touch. The toasted shredded coconut and lime zest adds a lovely crispy texture along with flavour and aroma. A great contrast to the creaminess of the filling. I like to grease (either with coconut oil or cooking spray) the base and sides of the springform pan and line the base of the pan with parchment paper. This allows the cake to easily slide off the base and onto a platter for serving. Always zest the limes (the skin only and not the white pith underneath) before juicing them. I like to use a citrus zester, but using the smallest holes on a box grater works fine too. As always, be careful when zesting these small limes, you might end up grating your skin off… ouch. It has happened to me recently. Before juicing the lime, roll the uncut lime on a flat surface to encourage more juice to release. Cut in half and then use a citrus juicer or reamer to get the most juice of these little limes. I find that I can get a quarter cup of lime juice from two to three limes depending on their size. Buy toasted shredded coconut to save time in preparing the cheesecake. However, toasting coconut is really easy as well, especially if regular shredded coconut is what you have available or already in your pantry. Here are some simple directions to toast coconut in the oven: Preheat the oven to 325 degrees F. Spread the shredded coconut onto a parchment paper lined baking sheet and bake for 5-10 minutes, stirring every 5 minutes until lightly toasted. Check frequently to prevent it from burning (This is also repeated in the Notes section in the recipe card). This recipe uses a springform pan. I used a 9-inch springform pan, but an 8-inch springform pan will work too. This is the ideal pan to use to get a clean slice and a pretty round cake (especially if you care about presentation), but you can use a parchment lined 8 or 9-inch baking pan if you prefer. Want more no-bake desserts? Check out these recipes. The perfect summer (or anytime) dessert. 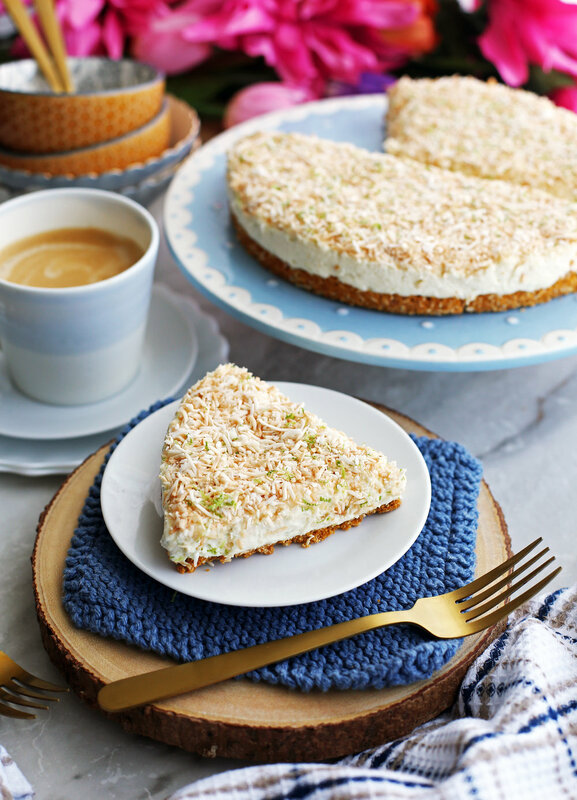 Super delicious: This cheesecake has amazing sweet and tart coconut and lime flavours and a yummy sweetened mascarpone and cream cheese filling. Full of great textures: It features a crisp toasted coconut topping and crust and soft, fluffy, creamy filling. So easy to make: It’s no-bake and has no complicated steps. No need to turn on the oven to make this cheesecake (although I do have a quick recipe in the notes on how to toast shredded coconut if needed). Perfect to make a day ahead: Or in the morning to be enjoyed later in the evening. This cake can be kept for up to four days. Store in the refrigerator. A crowd pleaser: It’s a slice and serve dessert that people love. Grease and line a 9-inch round springform pan with parchment paper and set aside. For the crust: In a medium bowl, stir together the graham cracker crumbs, toasted shredded coconut, and coconut oil until well-combined. Then pour into the springform pan and pat down the mixture into an even compact layer. Place the pan in the freezer while you prepare the rest of the cake. For the cake: Using an electric mixer (or stand mixer), place the condensed milk, cream cheese, mascarpone cheese, lime juice and zest, vanilla extract, and salt into a large bowl. Blend until the ingredients are creamy, smooth, and well-combined. Get the springform pan from the freezer and pour the cake mixture onto the crust. Using a spatula, spread the mixture into an even layer. For the topping: In a small bowl, combine the topping ingredients (toasted shredded coconut and lime zest) together. Then sprinkle the topping over the cake before pressing the topping slightly into the top of the cake. Cover the springform pan with plastic wrap and place in the refrigerator for at least 4 hours (or better overnight) until the cheesecake is set. *If you want to toast your own shredded coconut: Preheat the oven to 325 degrees F. Spread the shredded coconut onto a parchment paper lined baking sheet and bake for 5-10 minutes, stirring every 5 minutes until lightly toasted. Check frequently to prevent it from burning. Nutritional calories represent one serving for a total of 12 servings.